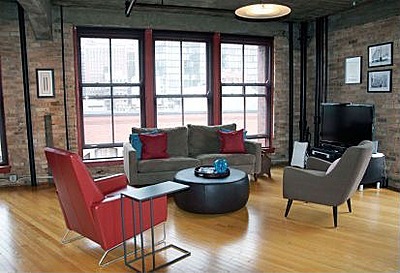 The South Loop is known for great loft real estate, high-end restaurants, and fabulous high-rise condos for sale. But what’s also available to home buyers in Chicago’s South Loop is a variety of work-live space that’s exceptional for local artists and small business entrepreneurs. As part of Printer’s Row, the majority of work-live lofts in Chicago’s South Loop are conveniently located on South Dearborn Street. Positioned very close to the Harrison Red Line stop and Grant Park, South Loop work-live lofts for sale provide not only a great Chicago location for you business, but also a convenient and upscale living environment that’s fun for both entertaining house guests and business clients. Currently, South Loop work live lofts are available at 711 South Dearborn Street and 727 South Dearborn Street. For more information on South Loop work-live lofts for sale and other work-live lofts in the Chicago Loop and West Loop, contact Ted Guarnero with the SeeChicagoRealEstate.com network at (312) 810-6693.